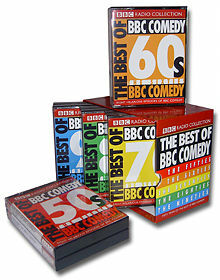 This cassette box set contains 20 audio tapes featuring 40 episodes of your all time favourite BBC Comedy Programmes. Including 'Take It From Here', Ray’s A Laugh', 'Educating Archie', 'Life With the Lyons', 'The Goon Show', 'Hancock’s Half Hour', 'The Clitheroe Kid', 'The Navy Lark', 'Steptoe & Son', 'The Likely Lads', 'I’m Sorry I’ll Read That Again', 'Round the Horne', 'Dad’s Army', 'Monty Python’s Flying Circus', 'The Liver Birds', 'The Two Ronnies', 'Last of the Summer Wine', 'Are You Being Served? ', 'Porridge', 'Morecambe and Wise', 'Fawlty Towers', 'The News Huddlines', 'Not the Nine O’clock News', 'Yes, Minister', 'Blackadder', 'Alas Smith and Jones', 'A Bit of Fry and Laurie', 'The Man From Auntie', 'One Foot In The Grave', 'Bottom', 'Absolutely Fabulous', 'The Fast Show', 'Harry Enfield and Chums', 'Goodness Gracious Me' and many more. Over 18 hours of some of the best British Comedy ever! An absolute must for anyone with a sense of humour.